In an arena that defines power in terms of position, prestige, wealth, prowess, cleverness, attractiveness, knowledge, and assets, we seldom consider compassion to be powerful. Yet, it we have a true understanding of compassion, we realize it takes far more strength and maturity to be compassionate than to be right. “Deep awareness of the suffering of another, coupled with a wish to relieve it. Compassion is not the tolerance of learned helplessness. We always want to support resilience and responsibility. Feeling a sense of living responsibly, with purpose and meaning, brings us deep satisfaction. Yet, there are times when all of us need help, support, encouragement, and a helping hand. That is the beauty and the power of connection, community, and compassion. Compassion requires letting go of judgment, without relinquishing reason and responsibility. Compassion requires a tremendous strength and courage to look at our experiences in truth, open our minds to reason, seek understanding, and make our choices from the wisdom of the heart. “To be truly compassionate our first task is to open our own hearts and, with kindness for ourselves, confront our own discomfort, fear and suffering. True compassion is like the sun, always present in the sky, but sometimes hidden behind thick layers of dark clouds . . . 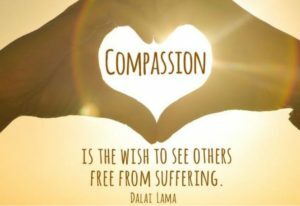 Living compassionately, from the heart, is not to ignore the harsh realities of life, or to sugar-coat difficult choices. It is rather to look face-on, with the purpose of understanding – not judgment – in order to bring about effective change. The greatest challenge is being compassionate with ourselves. We are our own worst critic – quick to judgment and quick to blame . . . ourselves. This critical inner voice developed from our earliest experiences with authority figures – those we trusted to help us find our way in life. The original intent of this voice was to guide and protect us. But when this inner voice lacks compassion, is harsh and impatient, and seeks to condemn us, we become immobilized, frozen, removed from our heart (the source of our real wisdom), and destined to eventually make self-destructive decisions, which ultimately impact those around us. Our inner guidance must be grounded in compassion in order to maintain a clear focus. Compassion often begins by forgiving ourselves; re-framing our decisions with empathy and understanding. It means making choices through the principal of cause and effect, rather than simply judging our decisions as “right” or “wrong”, “good” or “bad”, “black or white”. When we examine the potential result(s) of our choices, we get a pretty clear picture of what is compassionately sensible. This one shift in our thinking would transform how we relate to ourselves and how we relate to one another. If you think compassion is only for the gullible, the weak, or the fearful, you are mistaken. Spend just one day practicing only compassion, and then let’s talk about power . . .